There have been so many responses to my first two articles about “seeing sparkles” that I felt guided to write this further information. As the conversation continues, more information is brought out. And I see other areas that should be addressed concerning this newly recognized phenomenon. If this is your first time searching SPARKLES, then be sure to read the other posts I have made. They are listed just below here… ** Be sure to read all the comments that follow too, because the readers have other great information and experiences that just might answer one of your questions! Thanks to all that have posted comments over the past year, you have been so much help in this endeavor. As I said, if you are really looking for information regarding Sparkles, then be sure to read all of the comments with both articles, before you ask any questions. Please realize, that I am not an expert on this subject. But I am learning very quickly about the different aspects of it, and hope that I am able to help you understand, even if in only a small way, what might be going on. FEAR: This particular article is based on some questions that have come in dealing with fear about the sparkles: either by the children seeing them, or by their parents. Bear with me as I explain somethings that might help. Basically, energy is simply energy. Energy is always energy. Energy can take the form of many different things: clouds, houses, people, Jello, even thought forms. It also can be the way those in the spirit world show themselves (such as with Sparkles). Here is an example of how we sometimes view energy: If someone comes into your house, and you feel strange and uneasy around them, then you usually will say, “There’s something wrong with that person,” or “I get a bad feeling around him.” It depends on how we feel about the person as to whether we think it is good or bad. This is only a judgment. It is not how the energy is. It could be that the vibration of that person is just different from yours, and that is why you feel something. But it does not mean that the person is bad. The same thing can be said about other things in life, such as sparkles. The reason I say that is because our younger children have a difficult time relating what they see or feel to us. Their experience is still very limited to find references for this situation. So, if they have seen a scary movie, or ghost story, then they know the feeling of fear. It is a quickening, or tense feeling. Perhaps, the sparkles are connected to spirits or angels. But if there is no reference to that, then “ghost” might be what they say and believe. So, something that originally did not present itself as negative, becomes scary. Of course, this might not be the case for everyone. But I see this in many situations. Talk to your child about being powerful, just like the scenario about the playground. Each person is “in charge” of what goes on around them. You have a say so, wheather you want to be around good energy or bad energy. So your child needs to know that they are empowered to be in charge of that. Even if it is good sparkles, if your child is scared of it, or just doesn’t want it around them anymore, they should be able to do something about it. It is important to be nice and calm. Your child can say something like, “I don’t want to see you sparkles at night anymore. Go away now. Leave me alone.” They should say it very firmly, but in a nice way. If the child is too small, then the parent can help. But remember not to be agressive or angry about it. Through conversations with others, I have found that children usually out-grow the sparkles. At least, they become less intense. I think it has to do with being involved with the worldly things of life. Other chilodren embark on a wonderful connection and relationship with the sparkles. This would be similar to converstations with angels or spirit guides, which I consider normal. I am in the process of creating a resource list of websites, books and videos that might be of use concerning this. If you know of a good reference, be sure to comment here so others can benefit too. This list will be posted in a few days, so you might want to register to my blog and get an email when a new post is available. I hope this has helped you in some way. Right now, it is the journey of figuring this all out. And I am honored that you have joined me in it! Blessings to you and your experiences with Sparkles! Would you like to read all about seeing sparkles? 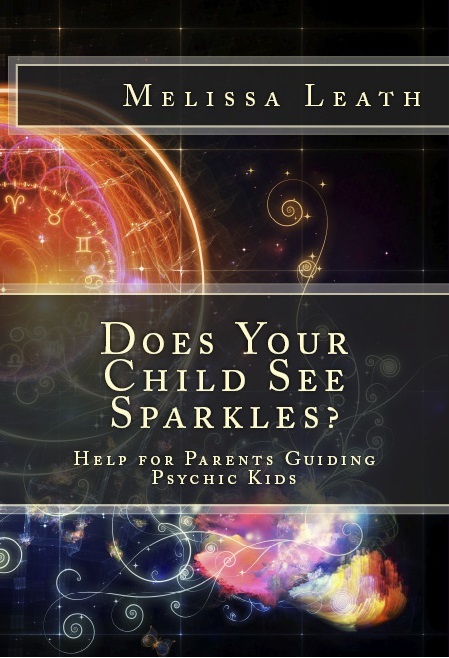 You can get all the particulars in Does Your Child See Sparkles? Help for Parents Guiding Psychic Kids. I’ve had several people reach out and ask me about seeing sparkles, especially young teens or mothers of smaller children. Since that blog article was published, search engines are connecting others to me as time goes along. So I felt the need to present more, in depth information about seeing sparkles. And perhaps give a little background about what might be going on. Understand that this is just my perception on the topic, as given to me by my spirit guides and higher self. What Do Sparkles Look Like? Sparkles, as seen by people, may look something like this: resembling small flecks of dust, iridescent particles, flashes of light, blinking clear lights and something called “static,” such as the static or fuzz you might see on the television when the station has gone off the air. What they are seeing are not physical things, but spiritual, energetic points of light. It is difficult to explain something without using common everyday things that we all recognize. Many have said they see them better at night, in the dark. While others (especially, smaller children, see them during the daylight, even outside in the Sun. Others see them swirling in patterns, sometimes in different colors. These people have said they occasionally see black or dark sparkles, but not very often. Sometimes they spin around and blend together. Usually, it is seen with eyes closed as well as open. Have You Ever Seen Fuzz and Particles? I thought for a long time that I just couldn’t understand seeing them. And wished I could see them so it would be easier to relate to my clients who have witnessed it. Then after going back into my childhood, I realized I have always seen sparkles. However, I would not have called them that. To me it is more like hazy fuzz. If I could describe it, I would say it was the substance that matter is made of. It looks like manifesting energy to me. Now that the veils are lifting from our awareness, and the energies are opening up to other dimensions; we are able to recognize things so much more. The separation between the earthly realm and the spiritual realm is beginning to open up and blend. The thing is that the sparkles (or energy field) have always been there: just as the aura around a person is always there, but many people cannot see it. Only after they have been instructed as to what it is, and how to see it, do they really recognize it. The way I understand, the particles that present themselves like sparkles are very visible. But it is not distinguished by the brain. It seems to be part of another dimension and not something that we are accustomed to seeing, so it does not register in the brain as real. Only after you understand that it could be a possibility can you begin to identify it. Another way to think about it is the spirits of those who have passed away are always around us. But we might not be able to see them. Sometimes, you can see movement out of the corner of your eye. You turn your head, trying to see it physically and it disappears. It works the same way with sparkles. Some children believe the sparkles are angel lights. That could be. There is a new resurgence of a phenomenon called “orbs”. They are large, round balls (at least larger than the sparkles) that float around, usually at night. Quite often they show up in photographs. They seem to represent spirit energies or entities of one kind or another and like to be around nature. So the thought that sparkles could be angel lights makes sense. I am given the information that the sparkles are “arranged” by angels in a manner that we can appreciate, and possibly connect with. If you close your eyes very tightly and rub them with your hands, then open them, you see sparks of light. This is a natural affect due to the pressure. But with energetic or spirited sparkles it works the other way around. You must lose your focus, not wanting to focus on anything. It works better when you are in your bedroom at night after you turn off the light. (I usually close my eyes as soon as the light goes out, because when I was a child, I could see these particles moving around, forming designs. It scared me so badly that I learned to close my eyes to keep from seeing it.) but it is a great experiment to try. Turn out your light. Lay in your bed with your eyes open. After your eyes get accustomed to the darkness, everything will have a haze, or film covering it. You might even see it moving around. Yes, you might even think you are going crazy! But believe me, you are not. The more you play with this concept, the more you will experience. This whole phenomenon is becoming more familiar to society. Many other things dealing with the paranormal is coming to the surface. Many children and young adults are showing more abilities to understand, and exhibit psychic and mediumistic tendencies. These children, known as indigos or crystal children, are usually highly empathic and don’t know how to deal with it. These young folks are introducing the change that is springing forth even now. Those of us who are in the paranormal and metaphysical fields are here to be guides for the way-showers, and help them keep grounded. Then they are able to assist us all in the transformation of the world. I believe the kids seeing sparkles fall into this group of indigos and crystal children. And we must do much more to be of assistance. A San Francisco cable car holds 60 people. This blog was viewed about 2,200 times in 2011. If it were a cable car, it would take about 37 trips to carry that many people.